Per usual, I can't believe we've started a new month! Today marks the start of my least favorite month (anyone else have one of those?). The reason I dislike August is also the reason I (in theory) should like it; it's represents the end of summer, but fall still seems so far away. But while we're still in summer, may as well in enjoy the London games! The Olympics definitely mean more to me as an adult then when I was younger and I love the fact that regardless of the individual sports teams we pull for, we're all pulling for the same team of red, white and blue! A couple of friends came over last Friday to enjoy fish and chips in honor of the Opening Ceremony. I was really excited when I found a recipe for baked fish and chips, and in my opinion, they were better than if they would've been fried. The Opening Ceremony was kind of the most bizarre/theatrical ceremony I've ever seen. I also half expected to see Effie Trinket's face to pop up on the screen and announce "Happy Olympic Games! 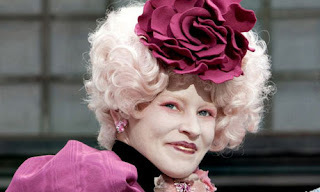 And may the odds be ever in your favor." On Saturday, my friend Allison came down to Charlotte for the afternoon. I had been wanting to try The Cowfish out for awhile, so I thought this would be the perfect place for lunch. It did not disappoint at all with it's incredibly unique menu consisting of amazing burgers and specialty sushi. I ended up trying their Apple, Berry & Brie Turkey Burger and my mouth starts watering just thinking about it! If you're ever in Charlotte, you HAVE to go here! You won't regret it. A Cuisinart SmartStick Blender! I haven't used it yet, but I have high hopes for all the possibilities. The other items I got mostly consisted of things I didn't know I needed, but all of a sudden couldn't live without. Anyone else ever experience that? Regardless, it was a borderline perfect Saturday. On Sunday, we finally went to see The Dark Knight Rises and as expected, loved it. Since my attention span leaves a lot to be desired, long movies and I usually don't mesh well, but Batman just doesn't let go. All in all, it was a wonderful weekend! one question. WHAT IS THAT YELLOW THING? Love stick blenders! Have had mine for years. Can make soup, salsa, dip, smoothies, baby food, apple sauce, sauces, purée anything.